Let is Snow, Let it Snow, Let it Snow"
Oh how I wish it will snow here in Southern California for Christmas. We moved from Chicago to California in 2006 and now I kinda missed having a White Christmas. 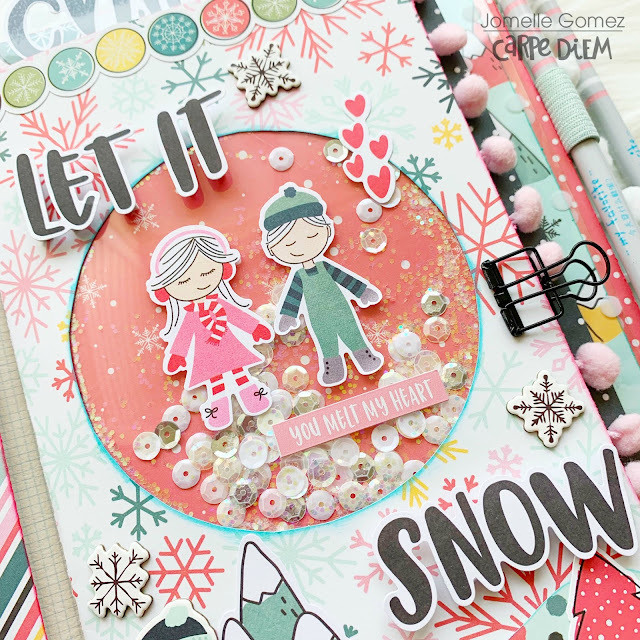 I want to share with you my Winter Set up in my Typewriter Circles Traveler's Notebook using the "Freezin' Season" Collection. This is my first time making a shaker insert cover. The first thing I did was to choose the pattern paper from the collection I want to use as my main cover. Then I cut out a circle in the middle of my insert cover. I then chose another pattern paper as the background. I used a laminated sheet and place it behind the circle I cut out. I added sequins and glitters from my stash on top of the laminate sheet. Then I added the background paper. Super easy. This shaker looks like a Snow globe in the middle of my cover. I used foam adhesive for the words "Let it Snow" to give it the 3D effect. 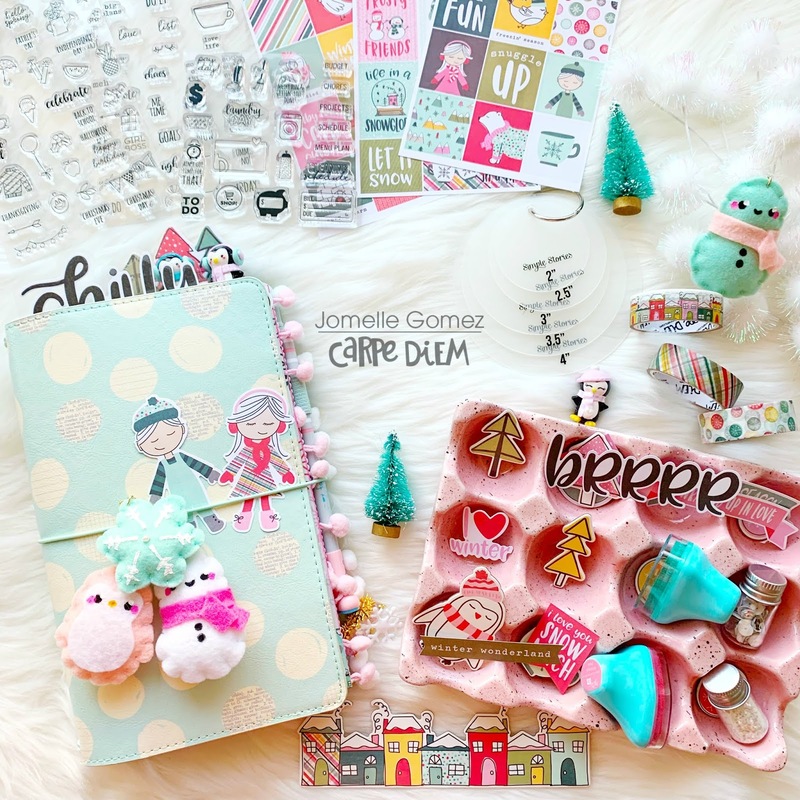 I bundled up my pockets with bits & pieces, chipboard stickers, and some of my cute winter paper clips to go with the collection. 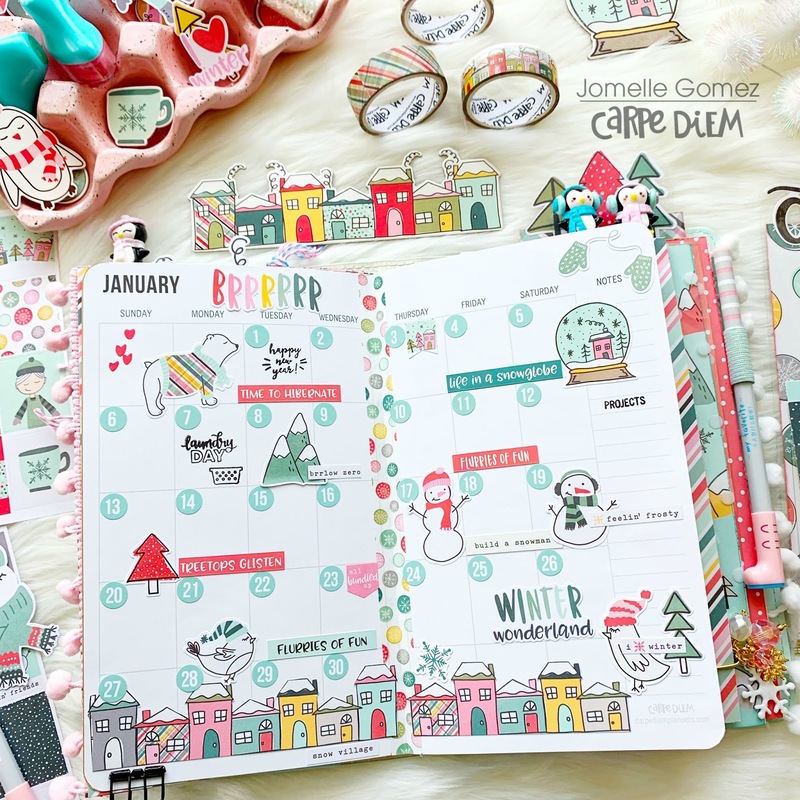 I'm starting 2019 with January layout all prettied up. The Freezin' Season is perfect to start the new year. 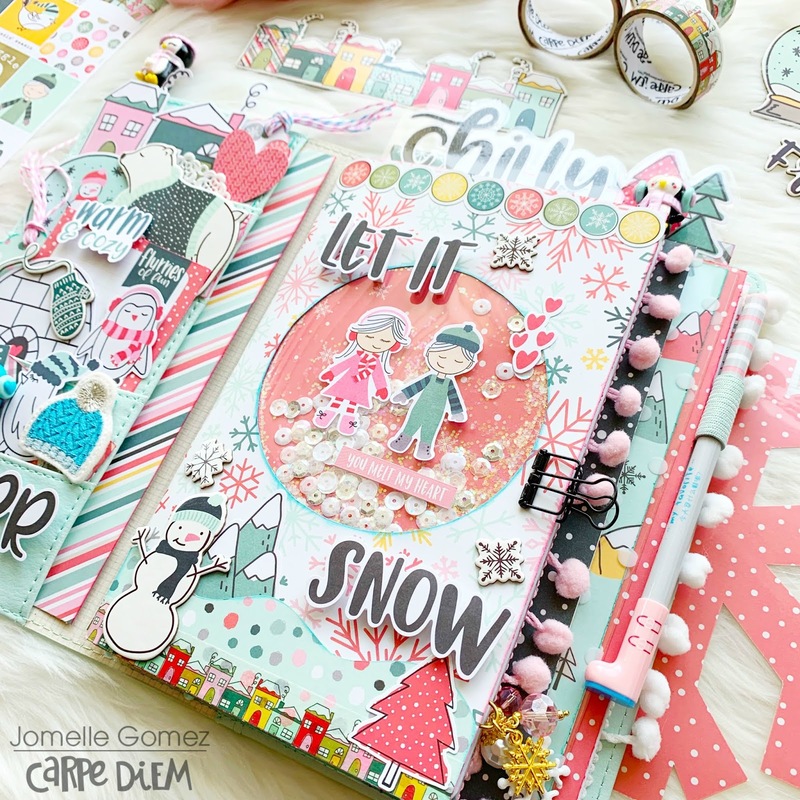 To create this layout, I first added the washi tape in the middle of the page. I used mostly the 4x6 stickers and combo stickers. I fussy cut the houses from the "Hello Winter" 12x12 paper and added it to the bottom of both pages to create my snow village. I already pre-decorated the pages after the month at a glance in the "Monthly" insert. I'm ready to document and journal for the month of January. I added the trees from bits & pieces on one of the 3x4 elements and laminated it to make a washi card holder. I wrapped the 3 washi tapes that matches the collection. I can also use this as a page marker. I also made a bookmark. I created this by also adding the word "chilly" from the bits & pieces on "Burrrlow Zero" 12x12 paper that I cut out to the size I wanted. Then I laminated it. I added a clear adhesive pocket on the bottom to hold some of the 3x4 elements. I finished it off by adding the houses washi tapes on the bottom. I wouldn't mind being "snowed in" in a cozy cabin all bundled up by the fireplace and playing with the "Freezin' Season" collection. I know that I'll have "snow" much fun. 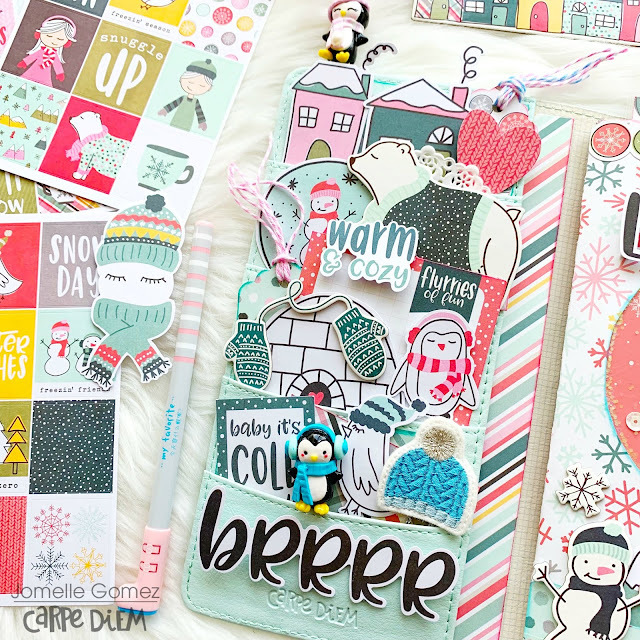 Cuteness overload is all I can say about the "Freezin' Season" collection. I just love everything about it. Will you experiencing a white Christmas this year?